Non-metals are not ductile, therefore they cannot be drawn into wires. The number of metals is much ………….. than non-metals. ……… are the good conductors of heat and electricity. Examples of non-metals are ………. , …….. and ……. Metallurgy is the science of extracting metals from their ores and purifying them for various uses. State general steps involved in metallurgy of a metal. Reduction of the metal compound. Metals are (softer/harder) than non-metals. Most non-metals are (bad/good) conductors of heat. The property that allows the metals to be hammered into thin sheets is called (ductility/ malleability). Melting point of most non-metals is (higher/lower) than metals. Arrange the following metals in the order of their decreasing chemical activity : magnesium, potassium, iron, gold. Can copper displace iron from iron sulphate solution ? Give reasons. Copper cannot displace iron from iron sulphate because copper is less reactive than iron. (Platinum/iron) is the member of the family of noble metals. Pure gold is (24/100) carats. International standards of weights are made of (gold-silver/platinum-iridium) alloy. Gold dissolves in (aqua regia/aqueous solution of silver nitrate). Silver tarnishes due to (nitrogen oxides/hydrogen sulphide) in the air. Why is aluminium used in making aeroplanes ? Aluminium is used in making aeroplanes, as it is light and has high resistance to corrosion when exposed to air which aircrafts demand the most. What type of oxides are formed by metals ? What type of oxides are formed by non-metals ? Non-metals form acidic or neutral oxides. How does phosphorus occur in nature ? Phosphorus occurs in nature in the combined state as it has strong affinity for oxygen. Give the different forms of silica in nature. Silica occurs in nature as ordinary sand, flint, quartz and opal. Which metal foil is used in packing of some medicine tablets ? Name the soft metal which can be cut with a knife. Name the non-metal used in vulcanization. Name one metal which is not malleable. Name one non-metal which has lustre. What would happen to iron railings if they are not painted ? Name the element commonly used for converting edible vegetable oils into vanaspati ghee. Name the element used for making containers of dry cells. Which metal is used for making radiators of cars ? Name the metal whose salt is used for making photographic films. Phosphorus is to be kept in water to prevent its contact with air because it is highly reactive. We cannot store acidic food stuffs in aluminium utensils because aluminium reacts with acids. The food gets spoilt. The goldsmith must have used acid to clean the gold jewellery and some gold must have dissolved in it. Therefore, there was loss in weight of the jewellery. Uses of metals – for making machinery, automobiles, industrial gadgets, building, bridges, cooking utensils, electrical gadgets, jewellery, sheets. Uses of non-metals – oxygen is used by plants and animals for their survival, nitrogen is used by plants for their growth, chlorine is used in water purification to kill germs, sulphur is used for making sulphuric acid, tincture iodine has antiseptic properties. Noble metals – Gold, silver and platinum are noble metals. They occur free in nature . and maintain their lustre for a long time. Platinum, gold and silver are used for making jewellery as they do not tarnish. Purity of gold is 15 carat. What is the percentage’of gold in the ornaments ? Give two uses of sulphur in chemical industry. It is used in the manufacture of sulphuric acid. It is used in the manufacture of carbon disulphide, which is used as an industrial solvent. How is sulphur useful in agriculture ? How is sulphur useful in medicine ? Sulphur powder is an excellent insecticide and fungicide. It is used in spraying fruit trees. Sulphur is the main constituent of skin ointments. Metallic sulphides of sulphur are used in the preparation of Ayurvedic medicines. Give two important uses of silver. It is used for making coins. Silver salts (silver bromide and silver iodide) are used for making photographic films. Give two uses of gold. Gold is used for making ornaments. Gold foils are used in the preparation of Ayurvedic medicines. Give two uses of platinum. It is used as a catalyst in the manufacture of sulphuric and nitric acid. Platinum catalytic converters use platinum as catalytic agent. P (Phosphorus) will form acidic oxide because it is a non-metal. You are given two materials X and Y. On hammering X is flattened, but Y breaks. Which one is a metal ? X is a metal because it flattens, i.e., it is malleable. There are four materials A, B, C and D. A and D are hard and shiny, but B and C are dull and not very hard. Identify the metals and non-metals from A, B, C and D.
A and D are metals. B and C are non-metals. Gaurav knows that wires can be made from copper and aluminium. He tries to make wire . from sulphur and carbon. Will he succeed ? Give reason also. No, he will not succeed because sulphur and carbon are non-metals. Non-metals are not ductile, that is, they cannot be drawn into wires. Most reactive metal is K and least reactive metal is Au. An iron knife kept dipped in blue copper sulphate solution changes to light green because iron replaces copper from copper sulphate and forms iron sulphate. This happens because iron is more reactive than copper. Silver is used in jewellery. Copper is used in electrical wiring. Sodium is stored in kerosene oil. Silver does not corrode and it is malleable and ductile, therefore, it can be used in jewellery. Copper is used in electrical wiring because it is a good conductor of electricity. Sodium has low ignition temperature. It oxidises quickly and bums when exposed to air. It can only be stored in a liquid hydrocarbon like mineral oil or kerosene oil. Taking the examples of magnesium and sulphur explain how metals and non-metals produce oxides with different characteristics. 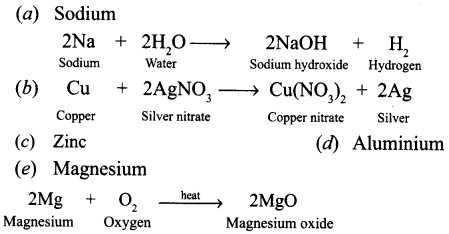 Magnesium bums in oxygen to form magnesium oxide, which dissolves in water to form magnesium hydroxide – an alkali. Magnesium hydroxide changes red litmus into blue. Sulphur bums in air to form sulphur dioxide, which dissolves in water to form sulphurous acid – an acid which turns blue litmus into red. Compare the following chemical properties of metals and non-metals. Metals form cations whereas non-metals form anions. Metals react with dilute mineral acid to liberate hydrogen. Non-metals do not react with dilute mineral acids. Metals do not react with hydrogen but non-metals react with hydrogen to form hydrides. (a) Hydrochloric acid is poured on aluminium foils ? (b) Sodium is placed in water ? (c) Sulphur dioxide is dissolved in water ? Metals are used for making bells. We can’t use pure gold to make jewellery. A metal ribbon bums in air with bright white light and forms a white powder. Which metal is this ? Give the equation of the reaction taking place. The metallic oxide formed would be acidic or basic in nature ? Nothing will happen as copper does not react with hydrochloric acid. Metals have the property of sonorosity so they are used for making bells. Pure gold cannot be used for making jewellery because it is very soft. Silver is used in making mirrors. Aluminium is used to make electrical wire. Iron is used in construction of bridges and houses. Graphite is used as an electrode in the dry cell. Iron sheets are galvanised before use. Silver has the ability to reflect light, therefore, it is used for making mirrors. Aluminium is a good conductor of electricity, so, it is used for making electrical wires. Iron is a strong metal, therefore, it is mixed with concrete to make bridges and houses. Graphite is a good conductor of electricity, therefore, it is used as an electrode in dry cell. Iron sheets are galvanised before use so that they do not corrode. Phosphoms is a very ………… non-metal. Iron is ……… reactive than copper. Metals react with acids to produce ………. gas. 1. Appearance Solid at room temperature except mercury. They are either solids or gases except bromine (liquid). 2. Hardness They are hard They are brittle. Aluminium foils are used to wrap food items. Immersion rods for heating liquids are made up of metallic substances. Copper cannot displace zinc from its salt solution. Sodium and potassium are stored in kerosene. Aluminium is a highly malleable metal and can be made into foils. So, it can be used to wrap food items. Metals are good conductors of electricity, therefore, they are used for making immersion rods. Copper is less reactive than zinc. Therefore, it cannot displace zinc from its salt solution. Sodium and potassium are highly reactive metals. On exposure to air, they get oxidized. To avoid this they are stored in kerosene. Dilute sulphuric acid is poured on copper plate ? Iron nails are placed in copper sulphate solution ? Write word equations of the reactions involved. When sulphuric acid is poured on copper plate, copper sulphate and hydrogen gas are produced. Copper + Sulphuric acid ——-> Copper sulphate + Hydrogen (gas). When iron nails are placed in copper sulphate solution, iron sulphate and copper are formed. (a) How will she find the nature of the gas ? 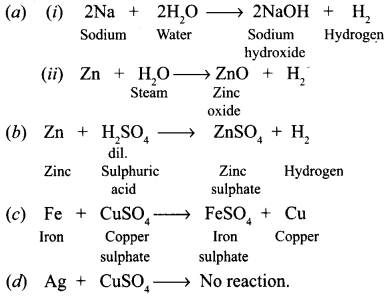 (b) Write down word equations of all the reactions taking place in this process. (a) The nature of gas can be found by passing it lime water, which will turn milky. List different uses of metals that you come across in everyday life. pins, cooking utensils, electrical gadgets. thin sheets used for wrapping of food items, medicines, etc. Choose appropriate words from the brackets and complete the statements. Noble gases are found in (free state/compound forms). Potassium after combustion will form (acidic oxide/basic oxide). German silver has (copper/silver) as major constituent. Sodium is more reactive than magnesium. Magnesium reacts with cold water. All metals exist in solid form at room temperature. Gallium has a low melting point. Gold is alloyed with copper to make it hard. (a) Two metals which will liberate hydrogen from water. (b) One metal which is used to prepare hydrogen gas in the laboratory. (c) One metal which will displace copper from copper sulphate solution. (d) One metal which will not displace copper from copper sulphate solution. Name one metal which will fit each of the following description. Also write the equation of the reaction. (a) A metal which floats on water, reacts with it and forms an alkali. (b) A metal that displaces silver from silver nitrate solution. (c) A metal which is used for galvanising iron. (d) A metal that reacts with oxygen without burning. (e) A metal that bums in oxygen with a bright light. A set of metals in order of their increasing chemical reactivity is given below : silver, copper, lead, iron, zinc, magnesium and sodium. Which of the above metals is stored in kerosene ? Which metals will react with cold water ? Which gas will be liberated when metals react with cold water ? Which of the metals will react with oxygen when heated ? Which of the metals become black in the presence of hydrogen sulphide ? Which of the following properties is generally not shown by metals? Alloys are homogeneous mixtures of a metal with a metal or non-metal. Which among the following aljoys contain non-metal as one of its constituents? Which of the following is purest form of carbon? Which among the following alloys contain mercury as one of its constituents? Generally, non-metals are not conductors of electricity, which of the following is a good conductor of electricity? Which of the following non-metals is a liquid?